To manage Automobile manufacturing is a big headache compared to other manufacturing plants. The main reason is that it includes a lot of steps in the manufacturing process. Every level includes assembling of small parts and components. A single missing piece can cause considerable damage to the entire manufacturing process and the vehicle itself. Earlier when cars used to manufactured and assembled by humans the chances of errors were high. But, ever since the inception of robotic hands, the car manufacturing process got streamlined. Also, with advance monitors, the quality check has become much more precise. It increased the manufacturing speed and efficiency. The question is: Why do we need Automotive IoT solutions when robots and advance level monitors are already providing great automobile solutions? The answer is the increasing demand of consumers. 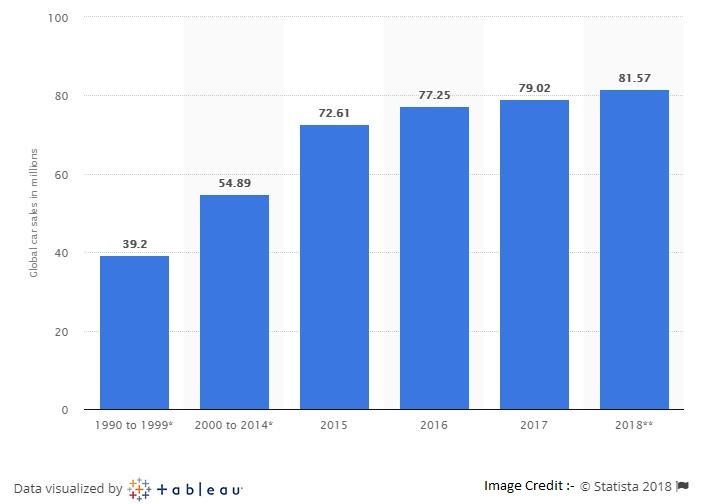 According to statista, Global car sales worldwide will reach 81.57 million units by the end of 2018. It is 108% more than what it was 28 years ago in 1990. A lot of people worldwide do not receive on-time delivery of the car they have ordered. 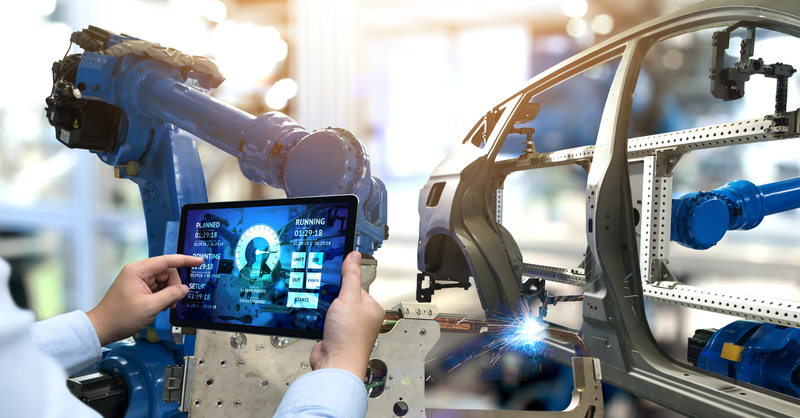 Let’s have a sneak peak on how Automotive IoT Solutions and manufacturing mobility solutions can clear clouds and bring new sunlight to the Auto manufacturing business. IoT has been changing the face of a lot of industries and businesses yet; there are many businesses which have never paved the path of IoT and facing failure. Even if the businesses do not fail, they can not expect the success in the future either. IoT is going to be the core element of the new Industrial revolution or popularly known as Industry 4.0. Let’s take a deep dive into the benefits IoT can provide to manufacturers. Automotive IoT solutions can help manufacturers reduce the cost by reducing the human force. With smart sensors and improved communication between the existing robots and machines, it will do all humane tasks better than humans. Their salaries can be utilized to make more robust manufacturing machines. Feedback from the customers can help us cut the cost. We can address the problems faced by the consumer in the delivery process and try to implement their suggestions in the manufacturing process. IoT helps us gather the data which is relevant for manufacturers to cut costs. IoT will reduce the failure rate by auto-detecting the fault in the machinery. The central system will do two tasks simultaneously. It will inform the maintenance staff and call a worker ASAP so that the assembly line doesn’t stop. As far as human errors are concerned, smart sensors will detect them in the next level of assembly and send it to error resolving department. Once the error is fixed, the car will be sent back to the regular assembly line. This is how IoT will bring down failure rate to zero. It will not only reduce errors but also saves time and money and improve production. If factory employees are productive than there is no doubt that the company can grow faster. Big factories produce a lot of harmful fumes and can create air pollution within the factory. IoT helps to clean the air inside the factory by means of smart sensor networks. It helps to maintain an eco-friendly environment inside the manufacturing facility and increase employee efficiency. Auto manufacturing is not a one man’s job. Every employee needs to cooperate with each other and has to work hand in hand. We can increase employee productivity by making robots working alongside workers. With IoT and smart human detection, it is now much safer to let robots work with humans. As far as human errors are concerned, smart sensors will detect them in the next level of assembly and send it to error resolving department. Once the error is fixed, the car will be sent back to the regular assembly line. We can enhance factory productivity by increasing the effective utilization of all types of equipment and machines. With IoT, we can make the optimum use of all machinery present in the factory. It can help us measure the efficiency of every device along with its total work time. Increase your sales by knowing your customers even more with the help of IoT. The more we know about the needs of customers, the better we can serve them. IoT helps us to collect the consumer data from different areas such as website, car dealerships, feedback, etc. and streamline it. By applying this data to manufacturing, we can deliver a customer experience like they would have never thought. We can improve customer experience by delivering only the best quality products. With IoT, the quality of work will improve and hence the number of low quality or faulty products will decrease. Product quality increases with IoT as it reduces manual labor and brings in automation in every step of the manufacturing. IoT has raised the bar of quality in Auto manufacturing. It has streamlined the process of manufacturing as well as delivery. Customers are now receiving better quality of product with almost zero waiting period. Smart automotive IoT solutions will help you climb the ladder of business success. Want to deliver an enriched experience to your customers? Get in touch with our IoT experts now!